Justin Lerner comes from New Jersey and has been playing guitar since an early age. In 2006 he released his debut album, “The dividing line”. 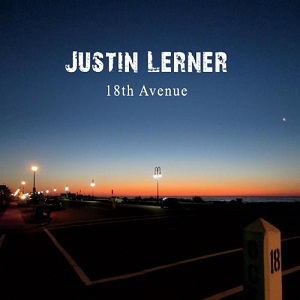 Now, his second album “18th avenue” has been released. Well calling it an album is a slightly debatable point – with just six tracks it’s more an EP than an album, and the total running time being just half an hour tends to fall somewhere between an EP and an album. OK some albums are short – Slayer’s ‘Reign in blood’ for instance, but rock albums are rarely this short, and when they are they still tend to have more than six songs – in fact I can’t think of a rock album off the top of my head that has so few songs – lets face it, even Iron Butterfly managed 12 tracks on ‘In a gadda da vida’ despite one song lasting 17 minutes (that one song lasts over half the length of this entire release). So we’re off to a disappointing start with such a short album that lacks enough tracks, but maybe things will get better once we start listening to it – after all he’s from New Jersey, home of Bon Jovi and Bruce Springsteen. Sadly the album itself still proves disappointing. Yes the songs are well written and performed well wtih some nice guitar solos included, but there’s no real edge to them – nothing that really reaches out and grabs the listeners attention. I’d say it’s a bit like a blander version on Bon Jovi’s later stuff (i.e. when they were well past their best). Title track, “18th avenue” is the best track here, and that’s largely thanks to the guitar solo towards the end of the song that helps it stand out from the rest of the album.